Learning is the subjective process of acquiring knowledge and skills and therefore finding a globally optimal learning pathway is simply impossible. Indeed, it is generally recognized that different learning styles and techniques fit different persons. For instance, some people prefer to learn using pictures and spatial understanding (visual style), while others prefer to learn using words (linguistic style). Furthermore, some people prefer to learn in groups (social style), while others prefer to work alone (solitary style). In addition, each person has its own attitude, cultural background, learning pace, curiosity, habits, competency, preferences, etc. As a consequence, it is straightforward that tailoring learning so as to meet the needs of each subject is a significant concept that can improve the educational level and enhance the social skills of people living in a community. However, personalization of learning using conventional ways (i.e., schooling approaches, book-based learning, etc) has been the exclusive privilege of merely a tiny subset of people who could afford the accompanying cost of such a service. Even in this case though, the personalized service is far from being optimal and perfectly individualized due to inherent constraints of traditional face-to- face tutoring (e.g., limited available time, lack of devotion, etc). It is only the recent advance in Information and Communication Technologies (ICT) that has enabled the spread of personalized learning across the largest part of community. The main advantage of technology-enhanced learning is the ability to offer automated methods, which are easy to be accessed for example through the web. In this context, recently there have been developed a number of virtual labs emulating real lab environments, where users can accomplish a number of learning tasks and conduct various experiments with no cost and risk. However, the big challenge of such labs is to find effective ways to boost the experience factor in order to motivate the engagement of students with the learning system and prevent them from churning out. In this context, the overarching goal of ENVISAGE is to enhance the design of virtual labs leading to optimal personalized learning processes. 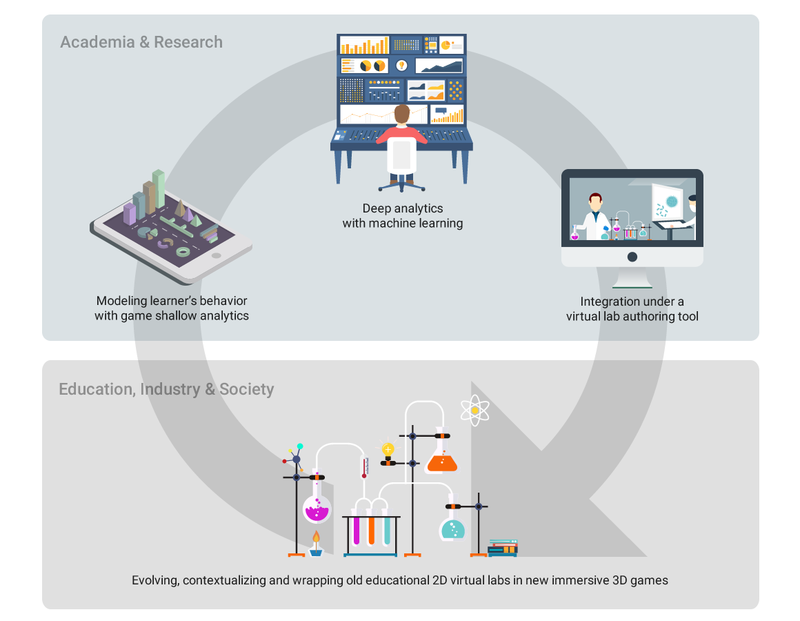 Towards this end, the project aims to develop an authoring environment, which equipped with data analytics methods and visualization tools that have been developed and reached maturity in the gaming industry, is suitable for iteratively evolving the design of virtual labs and for dynamically adapting the learning content to the users of the virtual labs.